The Gnu Data Language is an interactive interpreter/incremental compiler for the GNU Data Language, which is primarily used in scientific, astronomical, medical and geo-science data processing applications. It supports graphical output and is intentionally designed to be highly compatible with the commercial IDL language. 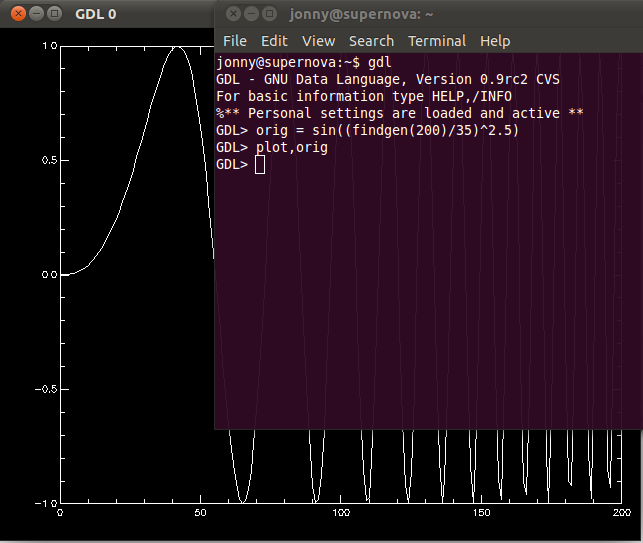 GDL is a free IDL (Interactive Data Language) compatible incremental compiler (ie. runs IDL programs). For a list of functions / compatability try this list. After installation and choosing an editor it is time to delve in to some code. In the “Beginner Code Examples” below, I am the beginner so no questions about programming please! Open a terminal (e.g. 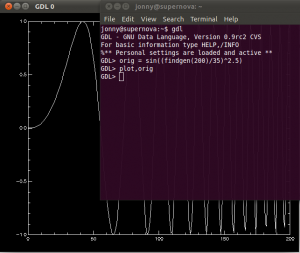 Applications > Accessories > Terminal ) and start GDL with command gdl on the command line. A window should be displayed possibly not displaying much of the moon image but I don’t yet know the purpose of loadct except that it accepts values from 0 to 40 so you could try a few of these to see what they do – I’m on the steeper end of a learning curve here. Function not found: DIALOG_PICKFILE – The function for a GUI to choose a file. I couldn’t find this so it is possibly not part of GDL. GDLFFDICOM__ASSOC::ASSOC: No pixeldata tag found – I received this error when trying to read a dicom file I was given e.g. dicom_obj -> Read(‘Sagittal_slice’) . However, when I used a dicom image downloaded online it worked fine. Possibly some header metadata missing on this dicom image? QUERY_IMAGE and DIALOG_PICKFILE are available since years in GDL. 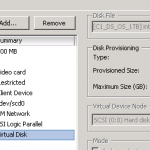 Don’t hesitate to provide the Dicom file with problem.